Recent advances in psychological intervention research have led to an increase in evidence-based interventions (EBIs), yet there remains a lag in dissemination and implementation of EBIs. Task-shifting and the train-the-trainer (TTT) model offer two potential strategies for enhancing reach of EBIs. 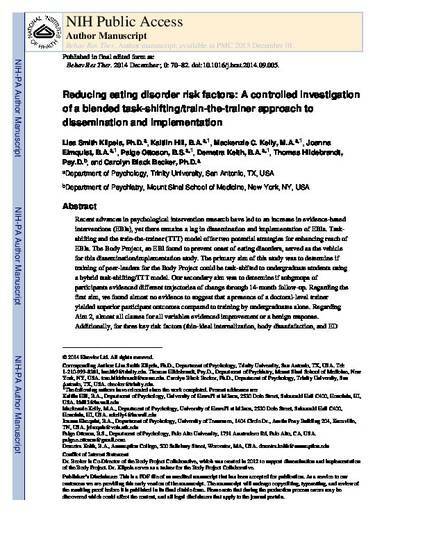 The Body Project, an EBI found to prevent onset of eating disorders, served as the vehicle for this dissemination/implementation study. The primary aim of this study was to determine if training of peer-leaders for the Body Project could be task-shifted to undergraduate students using a hybrid task-shifting/TTT model. Our secondary aim was to determine if subgroups of participants evidenced different trajectories of change through 14-month follow-up. Regarding the first aim, we found almost no evidence to suggest that a presence of a doctoral-level trainer yielded superior participant outcomes compared to training by undergraduates alone. Regarding Aim 2, almost all classes for all variables evidenced improvement or a benign response. Additionally, for three key risk factors (thin-ideal internalization, body dissatisfaction, and ED symptoms) virtually all trajectories showed improvement. This study provides initial support for the use of a blended task-shifting/TTT approach to dissemination and implementation within prevention generally, and further support for broad dissemination of the Body Project specifically.